Today it is 6 months since you left your Mom and Dad and us and it seems like a lifetime ago. I know your Mom and Dad are struggling with each day and today has been pretty hard, probably harder than most but who can judge the sense of pain. 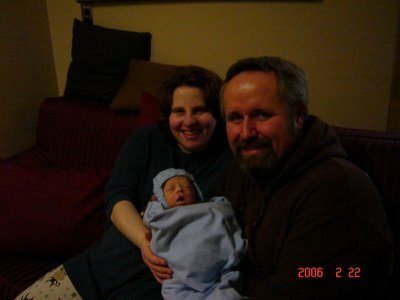 Its a double whammy that Colleen and Glenn had their baby Charlie. I think of you often, especially when I see your cousin Aidan and feel like you should be here to play with and hug, but there's no rhyme nor reason to life and crap happens - more to some people than others - but you deal with what you get. I wish I could make the pain go away but I can't, I can only believe it will get easier to bear with time and hope that it happens sooner than later. I'll bet you were sending me all that sunshine today, to let me know you are always around me, and today especially since Colleen and Glenn had their baby boy Charlie. Thank you for watching over them, and helping Charlie come into this world to be with Glenn and Colleen. I love you to the moon and back My Baby Boy, always have, always will. I always tell your Momma that too much thinkin' just gets her into trouble, but today it was my turn. Today you would have been 6 months old, a half a year old. I just have to look at pictures of your cousin Aiden to see how big you would have been(I bet you would have been bigger because you had my genes). Would you have been crawling? No, I think you would have already been running laps around all the other babies:) People say to move on but it's hard, I know I don't say it enough but I miss you so much, if I could just hold you in my arms again. Hi Baby Boy. I can't believe tomorrow it will be 6 months ago that I had you. I don't know how so much time has gone by. The past 6 months feels like I've just been thrown into the ocean. At first the waves pounded me into the rocks, I was exhausted, in more pain than I thought I could live with, and then when I thought I was ready for death myself, the waves pulled me out, just a little bit. I rode the waves up and down, completly unaware of what was hapening, inside of myself and around me, and then, next thing I know, its slowed down, just enough that I start to see around me, before I'm pulled off again. Now, 6 months along, and the waves are more predictable, going up and down, I can see when a big wave is comming, and sometimes even brace myself for it. I do know that no matter how much time goes by, no matter where I go, I will never stop missing you Mr. Twinkle Toes, or wishing that I could have you back to dance with me.